djkardkreations: WOYWW 161 and Less Is More 74 ~ Lucky Dip! WOYWW 161 and Less Is More 74 ~ Lucky Dip! Happy 4th of July in America or it will be when some of you read this. For the others, it's one day early, but I won't be on tomorrow to say it then. Please, everyone be cool in the terrible heat wave across this country and be safe with the festivities as the conditions are ripe for fires. 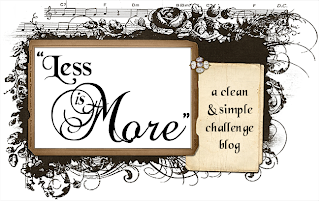 This week's Less Is More challenge was posted on Saturday, June 30, which was a fifth Saturday, which means it's a "Lucky Dip." Honestly, I didn't make that up, even though most of what I write I do make up. Chrissie and Mandi are the hosts and they made it up, so you just take your questions right on over there. They're standing by. All I know is that they asked the super talented Kim of Joyful Creations with Kim to be the guest designer. I also know that Kim just threw me for a fruit-loop when I went over to her blog to copy her urinal, I mean URL, because she has a new profile picture and I wasn't expecting that. It's a great one, Kim, but now I have to sit at the station for a second until I can get back on my Train of Thought. Oh, yes, anyway, Kim's card is excellent and so are the hostessess's cards and so are the participants' cards, all of whom used the Less is More beautiful logo for inspiration. To me, however, this turned out to be a diabolical challenge and more of an Unlucky Upheaval than a Lucky Dip. For some reason, I had the whillickers of a time. I ended up with a card, but three cards passed away in the process. Homicide, no question about it. And it left a crime scene on my workdesk. Which brings me to Julia's What's On Your Workdesk? Wednesday challenge. It's a whacky Wednesday wisit we all make to each other's blogs to see woz up! If you takepar, you're supposed to be brief because there are a lot of ladies and gentlemen in the queue and Wisiting Hours are limited. Some of us have a hard time with that. Like me, for instance, in case you didn't notice. But I'm okay with you stopping by to let me know you just looked at the pictures and didn't read my wattle. It's not a mess to some peep's way of thinking, but it's a mess to me which I'll need to clear up before I can start something new. It's just the Playhouse way of it. I had to take the picture inside because Mr. Sun shone rays through the acetate "love" and made double ovals and dots. (Trust me, if you hadn't yet drunk a double, you would have thought so.) I like the "LOVE" because Mandie and Chrissie always welcome players with love and always leave comments on our cards and always do so with love. Please join me in welcoming Carole of Brum! Not only does she have excellent information about blogging, but she is very talented with Copics coloring on her wonderful cards and she is very generous with her time giving helpful Copics coloring instructions! Hi there. Nice to pop in and see your creative world this week. I won't stay long; don't want to give you my cold! Hope you have a good creative week though. No problem combining your WOYWW post with another.. I meant that it's hard to find if WOYWW isn't in the title and people shouldn't bother linking up if it's not a WOYWW based post..please don't think this post is a rule breaker! Lovely card. Seems to be a lot of them on desks this week. Mine too! I love your happy and funny posts Darnell. You sound like a lot of fun. I wanna come play in your playhouse, but I'd need to tidy just a little bit . . . being a neat freak n all! Your LIM card is BEAUTIFUL . . . only sorry you committed 3 homicides in the process!!!! Completely agree - this week's LiM challenge was really hard! I would like to come to Playhouse to play too. Wouldn't it be fun? I always say if I became a millionaire, I would buy the entire SU catalogue and then go on a round the world trip and visit lots of blogland friends! I'm taking part in WOYWW for the first time this week! Fab LIM card - boy, you cracked it Darnell! Thanks for the shout out and so sorry I threw you for a fruit-loop!! But the old picture was 5 years old...it was time to move on. Between your fruit-loop moment and your Unlucky Upheaval, you have me laughing out loud and it's not even 6 a.m. My family is probably dreaming about mom losing it! Oooh...I've had that stamp on my wishlist forever! I love the pure, white butterfly you used on it on it and the clear "love" is the PERFECT sentiment for Chrissie and Mandi!! I wish I'd thought to take a picture of my work space(s) last night. I'd moved to table 2 and filled it up. Threw out my share of cards I'd murdered too. Hope to get pictures of what survived today. 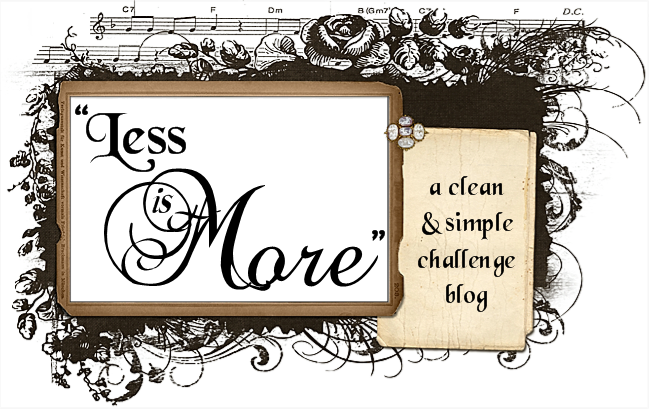 You did a wonderful job of recreating the Less is More header. I'm impressed that you used acetate! I love the white butterfly. He looks like he's getting ready to fly off the card, or on. Have a great 4th. I do have to admit like some others that your desk is just brilliant messy this is a rare moment indeed. Are the tissues there because you had tears after the homicide LOL Maybe murder in the dark could be your next theme LOL No seriously I love your less is more card, it is just perfect it really is. Gorgeous card and fab creative space! Love your posts Darnell Top marks for them, always! Darnell......can I come live with you in the play house please??? Honestly I would be no troubs - can bring goodies galore??? Pretty please?!!!....... you just crack me up - don't think I'd ever get sad and down with you - anyhoos while I'm waiting with baited breath for your response....Just love your card, it's gorgeous......love the acetate LOVE with the white O and white butterfly .....yummy. Well, told you I'd be back...it's a marvellois card, really lovely, but i do understand the whillicker pf the process...happens to me. Alot..i need boundaries!!! Darnell, Happy 4th of July! Another wonderful post and beautiful card...your desk looks a little like mine, but I did find time today to clear off and put things where they belong. Great card Darnell, so sorry to hear about the other two though! I must say, by the time I'd finished this challenge, my workdesk looked a little like yours - only worse!! Too bad to take a picture in fact. Thank you for your lovely comment. I'm so pleased you enjoy reading about the island. It's only a little place in the middle of the Irish Sea but it's not bad - the weather could be better though (lol). Great post Darnell, very funny! I agree, that desk's a mess get it cleaned up, no excuses! Love the LIM card, great take on it, I have that stamp but have yet to use it. Happy belated birthday too, looks like you had a fantastic party with your family and friends. Hope you had a great 4th too. Oh my, you are too much and so is your card!! Just beautiful...and I would never post a picture of MY stamping area....as my DGD says, "messy, messy"! Late getting around this week. Your desk looks GREAT to me! The card is very nice too. It might look messy, Darnell, but I call it creative! Great Less Is More card too.